London Welcomes Fritz Kraemer's Legacy: "Kissinger's Kissinger"
When I was invited by the World Security Network to the London launch of a new book on "Pentagon Strategist and Mentor Dr. Fritz Kraemer", I was interested but had not heard of him before. I asked my American co-trustees of another NGO (Astia.org) about him, given that many are graduates of Georgetown University and involved in U.S. politics. Given their response, this was a "not to miss" event based upon the unique life of a man of honor, duty and values. Prof. Peter Neumann from King's College (center left) and author Dr. Hubertus Hoffmann presented the new book about Pentagon Strategist and Mentor Dr. Fritz Kraemer ("True Keeper of the Holy Flame") in the prestigious Legatum Institute in the heart of London. They discussed with the international audience a fresh foreign policy World 3.0, moral values today and the need to nurture an adverse global responsibility-elite, as Kraemer did so successfully with Henry Kissinger, Alexander Haig and few more lucky protégés." In a way, Fritz Kraemer was back again in London in the form of his legacy. In the early 1920s he had studied at the prestigious London School of Economics. Returning to Germany during awful times, he had no realistic option but to flee to America in 1939 due to his Jewish family background. For many that sanctuary would have been enough, but with special courage he joined the U.S. Army, quickly becoming the only Staff Sergeant (and infantry lieutenant with a battlefield commission later) ever with two PhDs and one monocle. From the soil of the United Kingdom he marched in 1944 with the 84th U.S. Infantry Division (together with his protégé Henry Kissinger) to liberate his former fatherland from the Battle of the Bulge to the Elbe River. On the way he admired the gentlemanliness of the British approach to fighting, who were fighting for the spirit of free men and against Adolf Hitler. The British and their empire always retained that virtue so as not ever to forget humanity. As my father, a veteran of those times reminded me, we fought bad regimes not people. Now a new book on him entitled "True Keeper of the Holy Flame. 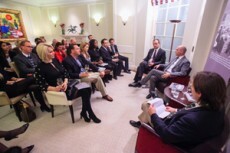 The Legacy of Pentagon Strategist and Mentor Dr Fritz Kraemer" was presented to an international audience in the influential Legatum Institute in the heart of London in Mayfair (www.li.com). It's President Jeffrey Gedmin praised Kraemer's promotion of a young responsibility-elite: "Today it is imperative that we focus on the cultivation and promoting of a new, fresh and diverse global elite. We need to transfer know-how, strategic imagination and a clear moral compass to a new generation. This is Fritz Kraemer's legacy - and our responsibility." It is a really impressive, 383 page, book which includes many pictures and a crisp modern black and white design, with many pearls of wisdom a reader may find and reflect on. Former U.S. Secretaries of State Henry Kissinger and Alexander Haig, who both were discovered and supported by Fritz Kraemer, former U.S. Secretary of Defense Donald Rumsfeld, U.S. Ambassadors Edward L. Rowny and Vernon A. Walters, German politician Friedrich Merz, NATO-General Klaus Naumann, and Henning-Hubertus Baron von Steuben tell stories of this influential Pentagon strategist and mentor. German geo-strategist and investor Dr. Hubertus Hoffmann is the author of this written monument. He was a protégé of Dr. Fritz Kraemer from 1978 to 2003 and collected his most important statements and recommendations. In 2001 they together founded the World Security Network Foundation involving young people in foreign affairs. It is now the largest of its kind worldwide (see www.worldsecuritynetwork.com and www.codesoftolerance.com; Facebook, Twitter and YouTube). The former Chief of Staff of the German Bundeswehr and the highest-ranking and personally well-regarded NATO General Klaus Naumann observes: "Fritz Kraemer is more up-to-date than ever. This book is a monument for a man for whom values – a moral ethical system of coordinates and convictions – comprised the hallmark of his life, values that Fritz Kraemer would not surrender under any circumstances. People of this caliber are the exception in all ages, but today among our superficial, value-free, 'me' generation they ought to be a protected species. I think it is high time to remember Fritz Kraemer and to take this book to heart." His protégé, former U.S. Secretary of State Alexander Haig adds: "For me, Dr. Kraemer's lifetime of service confirms the importance of the nation's elites in pursuing and advancing the value of a free society. I can think of no individual whose patient tutelage made a more meaningful contribution to the shaping of my own worldview." U.S. President Richard Nixon, whom he briefed with Kissinger in the Oval Office in 1972 (shown on the title of the book) praises: "I like him and read his stuff – I appreciate to have an intelligent appraisal by someone who really understands great forces at work in the world. It's been very helpful." Fritz Kraemer had been a moral compass and a rock of wisdom in the Pentagon from the early 1950s until his retirement in 1978, as the true "Dr. Strangelove" with a monocle, a walking stick in his hand and two PhDs as an intellectual background. He was "Kissinger's Kissinger" from 1944 until the mid 1970s, when he cut the relationship out of frustration. His master pupil and former U.S. Secretary of State Henry Kissinger remembered: "Fritz Kraemer was the greatest single influence of my formative years. An extraordinary man who will be part of my life as long as I draw breath. " He influenced many young talents and high ranking officers with his fighting-spirit and know-how. He died at the age of 95 and was buried with full military honours in Arlington National Cemetery on October 8, 2003. During the presentation by the author and Professor Peter Neumann from King's College in London, the participants discussed the full range of how to defend democratic values like Kraemer did. "His focus to nurture the future elite is his main legacy. Foreign policy is an elite business. Very rarely the population gets involved, only when it becomes a domestic issue or they suffer in wars. Mentoring is absolutely necessary as well today, creating elites who understand that foreign policy which is a about values and national interest. We need young creative people who support anti-totalitarian ideas and actions, like Kraemer did his whole life", argued Neumann. Kraemer himself urged many times, as Hoffmann remembered: "Our bourgeois society is idle and coward at heart. It does not recognize the imminence of the few determined radicals, or only when it is too late. The youth should not get lost in materialism but stay true to themselves. A fulfilled life requires idealism, not materialism. We need true individualism, striving against the stream, courage and self-discipline. " It is time to remember and digest Kraemer's philosophy of a free man fighting for the moral soul of free nations. Curiously many of my highly respected Astia NGO compatriots had not known of Kraemer, which was why I first wanted to fill my own lacuna of knowledge. Therefore I would add that it is also the time to help reset moral compasses - not just for the young, but for those who are middle-aged - for whom his guiding light is one they may be searching for in the wilderness of life. I will not hesitate to endorse this book especially amongst many of my "New American" friends whose origins may not be too far from those of Kissinger's Kissinger. Ex-NATO General (ret.) Klaus Naumann: "Let's start thinking about a new Grand Strategy for Peace and Security in the 21st Century!"